Chicken wings are synonymous with sporting events - especially football. The boys didn't love them growing up - wiser now, they have come around. This recipe never fails; we made it often back in our university days (Jane). 1. Prepare chicken wings by cutting wings into three sections - cutting off wing tips for another use. I like to cut off the excess fat at the end of the wing joint. 2. Mix together marinade ingredients in a container large enough to hold chicken. Add chicken wings and set aside for a few hours if possible to allow marinade to permeate chicken. 4. Put wings in a large baking tray and bake for about 45 minutes until wings are golden brown. Turn every 15 minutes or so basting with remaining marinade. 5. 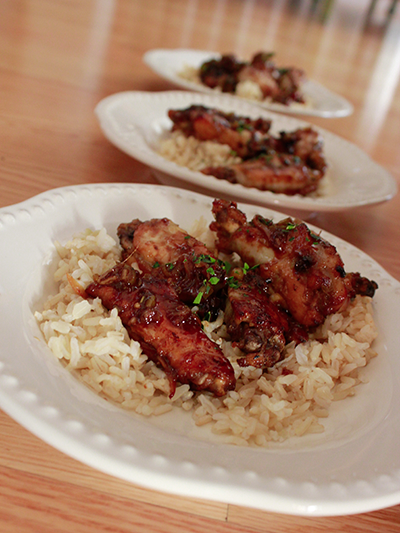 Serve wings with some rice and some of the reduced cooked marinade sauce. Add chopped cilantro for garnish. Tip: keep ginger in the refrigerator peeled and covered with dry sherry. The sherry can be used in cooking - it will be nicely infused with the flavor of ginger!